In 2004, after a six year campaign to bring Mt. Olive Pickle Company to the table to discuss labor protections for workers harvesting cucumbers in NC, FLOC won a collective bargaining agreement with the North Carolina Grower’s Association (NCGA). The NCGA is the nation’s largest user of the H2A program, a temporary visa which allows agricultural workers to come to the US to work seasonally. Each year, over 10,000 workers are recruited to work in NC through the NCGA, and all are covered by the FLOC union contract. 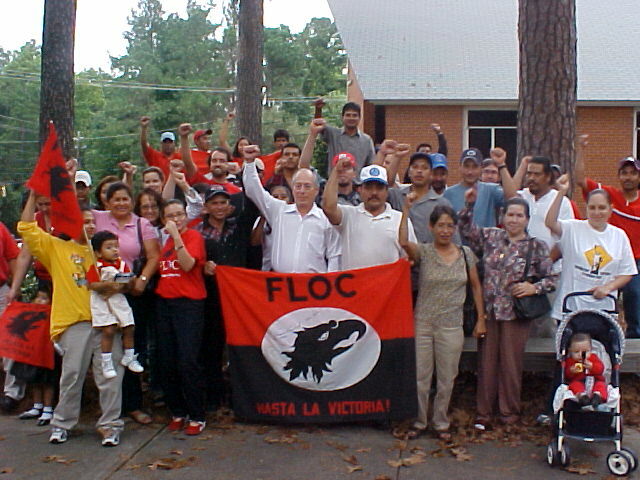 The union agreement secured important protections for all farmworkers who come through the NCGA: the right to appeal unjust warnings and firings, protection from retaliation from an employer, paid leave for family funerals, and an employment bid system allowing workers who successfully finished their last contract to submit a bid to return the following year. Each year, union representatives work with members to process hundreds of questions and complaints through the CBA’s grievance procedure. As our relationship with our collective bargaining partner has grown, we are able to resolve the majority of issues by email or phone, or a brief meeting. In 2017, FLOC helped 718 farmworkers process and resolve issues through the grievance mechanism, including 197 issues with travel reimbursements, 52 issues with labor recruiters in Mexico, and 27 concerns about healthy and safety. Click here to see the complete summary of 2017 complaints. In 2014, FLOC helped workers to handle over 800 cases through the collective bargaining agreement, including 229 wage complaints, 439 employment bids, and 21 concerns about working conditions, just to name a few. Click here to see the complete summary of 2014 complaints. In 2012, FLOC worked with members to resolve over 700 complaints throughout the season, including assisting 17 workers with workplace injuries, 36 workers with wages disputes, 25 concerns regarding health and safety on the job, 33 appeals of unjust warnings given by employers, and much more. Click here to see the full summary of 2012 complaints. In 2011, hundreds of members worked with the union to resolve job and housing related issues, and over 250 workers submitted employments bids. Click here to see the pamphlet with more about cases resolved in 2011. Next: Read about the Reynolds Campaign and our efforts to expand collective bargaining rights to tens of thousands of tobacco farmworkers.